So, you have this wonderful new idea for an Internet business—many have one—but web development and technology move at breathtaking speeds. Do you really have time to put together a business plan? Of the millions of Internet businesses that have opened in the last few years, how many of these put together a detailed business plan, or even a blueprint? It’s a small percentage. Most new online businesses think preparing a business plan is a waste of time, and by the same respect, over 80% of all new businesses fail, often in the first year. You have the vision, you may have lofty expectations of what you want to achieve, but do you know how to get there? There is no “one fits all” solution… Every business—and every one—is unique, even for companies within the same sector. Plus, if you have a successful business offline, that doesn’t guarantee the transition online will be easy, and there are extra considerations when you start any business on the internet. The primary purpose of any business plan is to give your business direction. In order to move forward, you need vision, planning, research, and goals. Not only do you need to convince yourself that your idea is viable, but a business plan will also convince others. Let’s say you want to raise capital, then your bank manager or potential investors will also need to see a detailed business plan. Writing a business plan forces you to analyze every aspect of your proposed business venture and whether you use ten or twenty sections to get you there, it puts your vision down on paper, proves your understanding of the business, highlights any hurdles you may not have expected, and ensures that the overall idea is realistic. Explain your new business and what you want to achieve. What are you currently doing that makes you believe you can make a success of? Explain in detail what your business does, detail your products & services and illustrate your goals. Developing a Web site also requires further planning. What do you want to achieve from the front end, your user interface? Is this an e-commerce business, or do you just want to promote your business or services? Do you want to generate hits or want users to sign up for membership? What do you want your clients to see and do? What resources do you have available? Are you using your own expertise, or will you be using employers or outsourcing work? If you have a successful business away from the internet, how will you make that transition online, and what effect will it have on your existing business? How will you create your Web site and what resources do you have available? When a web designer starts work on your site, you will need a blueprint of how your site comes together, and how the pages are organized and integrated. Outline your marketing strategy, your pricing strategy, and your plan to promote sales. Analyze your competitors and explain what will give you the edge, while at the same time list possible partners. Take the time to plan for contingencies, too. Show that you are aware of possible hurdles and how they can be overcome. Include timelines, goals, and explain where your Internet business will be in one year, five years, and ten years time, or within a scale that suits your business. If you think there are thousands of customers for your business, prove this figure and provide an up-to-date market analysis. You must include projected sales figures, cash flow and profit and loss forecasts. Not only will you need this to raise capital (in case you want to), but it provides you with a budget and planning tool to measure your progress. Finally, top it all off with an executive summary. This is like the blurb on the back page of a novel. Summarize your Internet business plan and explain it on one page, which will be the very first page. When approaching investors and bankers, it should encourage them to take the time and read through your Internet business plan. It ensures that you can encompass all your facts, figures, vision, and your mission into one statement. Thanks for stressing the importance of planning. Also, planning out small projects is a great way to get them completed I find. And it provides a means to justify the price you are quoting a client if you are say building a web site for them. I just create a simple gannt chart in a spreadsheet for this purpose and cut and paste an image of it to a proposal document. But, I do find long-term planning difficult. Rather than plan, I have a vision of what I want to get done. While a detailed plan used to be a necessity, nowadays the fast development in technology would render a detailed plan obsolete even before it is implemented. I almost have the same idea with Mr. Multivar above: I think the most important thing here is that your vision is clear to you. For bloggers, even if you are just starting to blog, especially if your focus is to monetize blog, considering to create a business plan is important. This will guide us in our vision to what we’re going to achieve online and help us keep going. great post. I agree 100% that you need a plan, because otherwise you end up running circles. It helps you to achieve your goals more efficiently. This is the different of doing business as usual or not. With business plan you have a better exposure about how your business will be in the future. Most of business without a good plan will stop after short period of time..
Attempt to produce quality content, attempt to get traffic, attempt to monetize! Sometimes, it may not make that much sense to thoroughly “plan” for something that is 5 or 10 years ahead, especially in Internet business. It may then be called a “vision”. Still, the more conscious and clear you are in what you wanna be, do or have, the better it is to have a detailed plan, one where you clearly see the next step in front of your eyes, and the next, and the next, and the next, etc. There are times when you are so engrossed in your running of your business that you lose your direction. A business plan details out the direction nicely. Just follow through instead of just drifting along aimlessly. 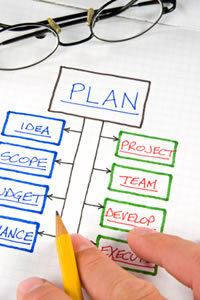 Great article, cut to the important points in writing an internet business plan. Thanks, Marcus, keep up the good work and multiply your profits. I think most new online entrepreneurs or anyone trying to start a business, don’t know where to start or how to create a good business plan. A good and affordable business planning software would be good. Building an Internet Business Is not as simple as 1-2-3 but I believe the First Step should be learning how an Internet Business operates. And In a nutshell the way you do this, Is by you first becoming a student of the business learning all you can, then applying that and then reaping the benefits. i am so interested in starting an Internet Business because there is a growing number of internet consumers today. I am still trying to learn a lot about managing and starting an Internet Business. Writing a business plan is still very important in all business endeavors. You have guide post to set your visions focus on one goal: To make your business profitable and successful. Great tips. I can see how i can use these in a real life situation. Great work keep it up. waw guy your funny enough? really interesting article thank you for your helpful hints towards getting my business off to a great start.